Design Creative Bling: Entry For MFT Sketch Challenge 229. Using the sketch challenge as my inspiration for my awsome mom's birthday card. 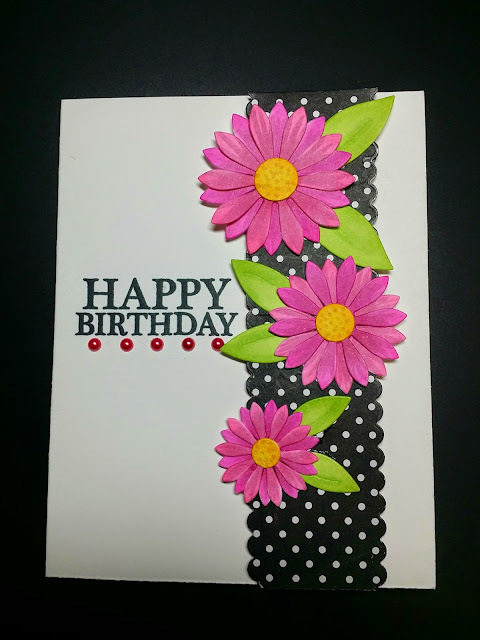 I cut the MFT Upsy Daisy Die-namics out of Neenah Solar White and colored them with Copics. The sentiment is from MFT Celebrate You stamp set and is stamped in Memento Tuxedo Black using the M.I.S.T.I. Choosing a strip of black swiss dot cardstock I used the small scallop border from MFT Blueprints to cut the edge. I then popped it up on fun foam, assembled my flowers and arranged them on the strip. To finish things off I added some hot pink mini pearls.